Demand for commercial spectrum to support broadband wireless communications has led the government to consider repurposing various radio frequencies, including the satellite communications bands next to GPS. The Department of Transportation's (DOT) approach to this task was to develop power limit criteria for transmitters in the bands near GPS. In April 2018, DOT released the final report of its GPS Adjacent Band Compatibility Assessment. In March 2018, the National Executive Committee released an assessment by its National Space-Based PNT Systems Engineering Forum (NPEF) of testing methodologies used to analyze the impacts of adjacent band interference on GPS receivers. The gap analysis concluded that the results from three of the five tests are sufficient and appropriate to inform spectrum policy makers on the major impacts of a proposed LTE network on GPS receivers. The DOT test results revealed the power levels that GPS and GNSS receivers can tolerate from interference sources in the adjacent band in an effort to inform the enforcement of a GPS interference protection criterion. The 2012 GPS Adjacent-Band Compatibility Assessment Plan provided the framework for DOT's development of power limit criteria for transmitters in the bands near GPS. The plan identified the processes to (a) derive power limit criteria to ensure new adjacent-band applications do not disrupt current GPS services and (b) determine similar levels needed for future GPS equipment using modernized and interoperable GNSS signals. These processes were used to develop and specify adjacent-band transmitter power limits needed to protect GPS/GNSS signals for civil applications. DOT began testing GPS/GNSS receivers in April 2016 pursuant to the final test plan published in March 2016. Device testing took place at the U.S. Army Research Laboratory at the White Sands Missile Range (WSMR) facility in New Mexico. All GPS device manufacturers had an opportunity to participate in the testing. NOTE: If you are seeking information about the National Advanced Spectrum and Communications Test Network (NASCTN) testing of LTE impacts to GPS devices, which is independent of the DOT testing, please visit the NASCTN website. The U.S. Department of Transportation hosted its sixth workshop on the GPS Adjacent Band Compatibility Assessment effort on March 30, 2017. The purpose was to discuss the results from testing of various categories of GPS/Global Navigation Satellite System (GNSS) receivers to include aviation (non-certified), cellular, general location/navigation, high precision and networks, timing, and space-based receivers, as well as use-case scenarios for these categories. To discuss the results from testing of various categories of GPS/GNSS receivers to include aviation (non-certified), cellular, general location/navigation, high precision and networks, timing, and space-based receivers. Also included a discussion on the development of use-case scenarios for these categories. To discuss the draft test plan and provide an opportunity for questions prior to the close of the comment period. Focused on the following topics: (i) Identification of GPS and Global Navigation Satellite System (GNSS) receivers to be considered for testing that are representative of the current categories of user applications; and (ii) discussion of a GPS/GNSS receiver test plan. Focused on the following topics: (i) GPS "use case" information, with emphasis on non-government applications; (ii) identification of current GPS receivers which are representative of the current categories of GPS applications and which should be considered for testing; and (iii) feedback on the GPS Adjacent Band Compatibility Assessment program implementation plan presented during the September 2014 workshop. 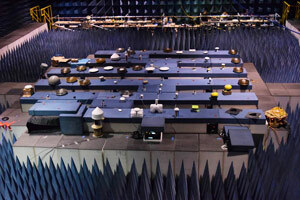 To discuss implementation of the Adjacent-Band Compatibility Assessment Plan, including development of GPS receiver use cases, identification of representative GPS receivers, and development of a test and analysis program.